Sat Physics subject questions on electromagnetism similar to the questions in the SAT test are presented with detailed solutions and explanations. The primary of a transformer is connected to a source of voltage that has two components: an alternating current (AC) component of 120 volts and a steady direct current (DC) component of 5 volts. The number of turns of the primary is 300 and the that of the secondary is 6000. What is the voltage at the output of the secondary? A transformer with an efficiency of 80% is connected to 50-volt alternating current source. The voltage and current in the secondary are 500 Volts and 0.1 Amperes respectively. What is the current in the primary? 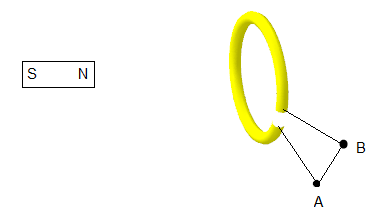 A magnet initially stationary is pushed closer to a loop then stopped. Which of the graphs of the current shown below closely represents the variation of the current in the galvanometer detecting the current in the loop? 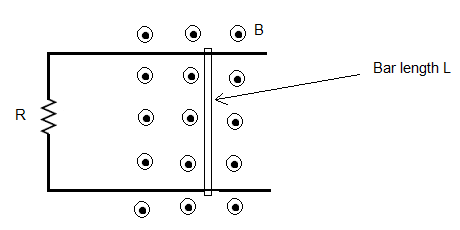 In the figure below the uniform magnetic field B is parallel to the rectangle. 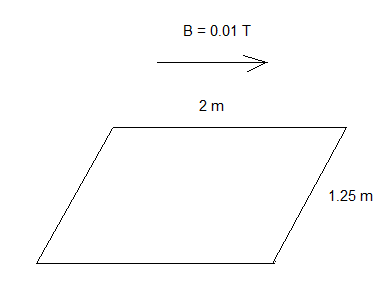 What is the magnetic flux of B through the rectangle? Let Vp, Ip and Np be the voltage, the current and the number of turns of the primary of an electric transformer and Vs, Is and Ns be the voltage, the current and the number of turns of its secondary. If this transformer is not 100% efficient, which of the following must be true? 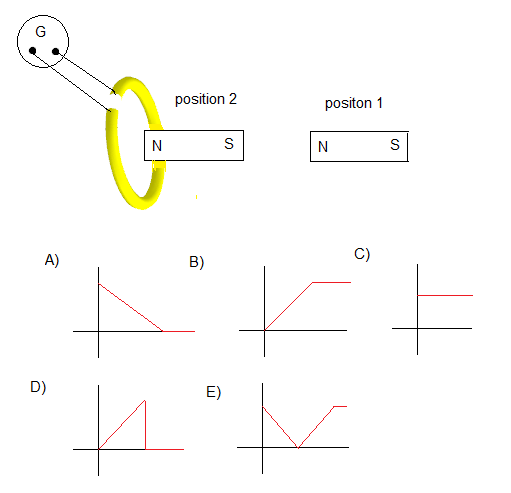 Which of the following laws may be used to find the direction of the current induced in a loop close to a moving magnet?